BEADNOVA - Bead and Nova, a bright star in beading and jewelry making industry. Founded in 2013, with nowadays hundreds of products exporting globally, BEADNOVA has been growing substantially to become one of the top sellers in jewelry making category on major online shop platforms in the States. Wide varieties and attention to quality, BEADNOVAs mission is to offer the easiest assembled combinations, accessible and affordable materials for jewelry making lovers. What makes us outstanding is that our dedication and passion to customer service. Amethyst has been highly esteemed throughout for its stunning beauty and legendary powers to stimulate, and soothe, the mind and emotions. It has always been associated with February, and is the traditional birthstone of February. It is the stone of St. Valentine and faithful love, and signifies ecclesiastical dignity as the Bishop's Stone. 3.All stone beads are unique and genuine. Size and color may be a little different from the one shown in the picture. UNISEX STYLE: Round Loose Beads with Standardized Hole size 1mm Center drilled style. This Natural Amethyst Purple Quartz gemstone style fits well for UNISEX style jewelry making, MEN or WOMEN JEWELRY. 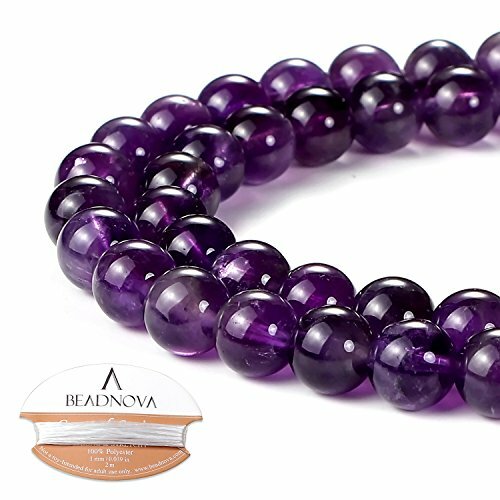 WIDE USAGE: BEADNOVA's beads are excellent for Beading, Jewelry Making, Jewelry Design, DIY gifts, Arts & Craft, Necklaces, Bracelets, Yoga bracelets, Earrings, Ring, Home & Wedding Decoration. Amethyst has been highly esteemed throughout for its stunning beauty and legendary powers to stimulate, and soothe, the mind and emotions. It has always been associated with February, and is the traditional birthstone of February. It is the stone of St. Valentine and faithful love, and signifies ecclesiastical dignity as the Bishop's Stone. It carries the energy of fire and passion, creativity and spirituality, but also keep the logic of temperance and sobriety. If you have any questions about this product by BEADNOVA, contact us by completing and submitting the form below. If you are looking for a specif part number, please include it with your message.